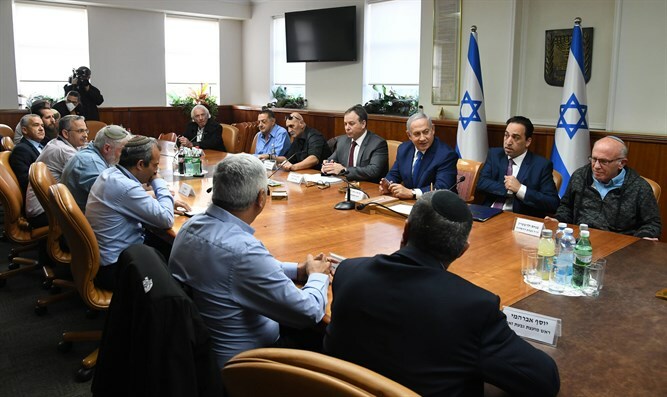 Shomron Regional Council head Yossi Dagan, Binyamin Regional Council head Yisrael Gantz, and Kiryat Arba council head Eliyahu Liebman do not regret their absence from a local council heads in Judea and Samaria meeting with Prime Minister Binyamin Netanyahu. "We won't compromise on resident's security for a photo opportunity with the Prime Minister," the three said in a joint statement. "To strengthen settlement, real answers and practical actions are required, not talk. "We stand firm and will continue to fight with courage and without bias to bring security to the residents," Dagan, Ganz, and Liebman promised. Prime Minister Netanyahu told the heads of local authorities who met with him, "We face an election campaign. In the upcoming campaign, the Left is trying to foment governmental change by mobilizing the media and other systems. They're all fully mobilized. They mustn't succeed - if, Heaven forbid, they succeed, there will be a clear danger to settlement. "The upcoming elections must be won," stressed the Prime Minister. "The fate of the State and settlement are not to be taken for granted, we had to work hard against the current US administration to bring about the great achievements that we brought to the settlements. None of this is guaranteed, because later on under a leftist government everything would be reversed in a moment." Jordan Valley Council head David Elhayani told Netanyahu: "Everyone here knows what happened here in the last decade. All settlement growth is tremendous and we all know it. In the elections we have to tell the residents the truth: Settlement is flourishing, and that is only because of you." Elhayani attacked council heads who boycotted the meeting. "We, as public leaders, condemn those who chose not to come here today. I'm ashamed of them and I mustn't give it credence. The dialogue between the leaders of the communities and you is open all year and when we need something we come to you and your people directly on the phone, so you don't have to be threatened - not with the blood of terror victims and not extortion," said the Jordan Valley Council head.